British civil rights – that’s what we were agitating and marching for in 1968. The demand was for the same citizenship rights as those enjoyed in Carlisle or Exeter, Reading or Inverness. With unemployment figures, ranked among the highest in Europe, local authority housing denied to the majority of the population, a gerrymandered electoral system, linked to franchise restrictions and blatant job discrimination, there was plenty to be angry about. Derry was a unique city in partitioned Ireland; it had a clear, nationalist majority of citizens but was a Mecca for Northern Loyalists because of its walls and the events of 1689 which were noisily celebrated annually on 12th August. Unemployment and housing discrimination were of much deeper concern to the majority Catholic population than the overt hostility of marching Orange bands. Decades of institutionalised poverty, lack of any economic optimism, uninspiring political leadership had bred listless complacency and apathy in many people; the dole was a way of life; the pawnbroker was a necessary service for some families and the loan shark a social evil. 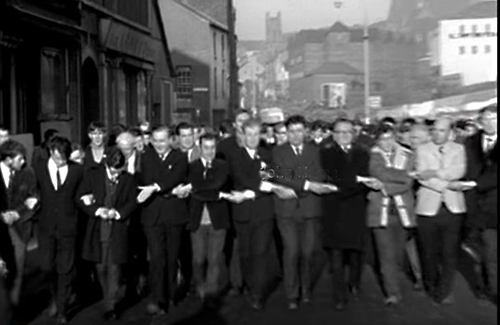 Two events in the sixties increased political awareness of people power and instilled a new measure of confidence in some – the founding of Derry Credit Union in 1960 and the united response to the Lockwood Report , demanding that Northern Ireland’s second university should be sited in the City. The former would go on to become one of the most successful community credit unions in the World which, to date, has provided nearly £1bn of low cost loans and financial services to its members and skilled employment for some 40 people; the University Campaign failed, not because of the determination and well argued case of its supporters but because of the entrenched bigotry of the Unionist Government at Stormont. Derry Labour Party was a constituent part of the Northern Ireland Labour Party but operated semi-autonomously in a type of Albania; it was as remote from the thinking of Labour leaders such as David Bleakley as readers are from the peaks of the Himalayas. It had attracted radical thinkers such as Dermie McClenaghan, Willie Breslin and Charlie Morrison who were committed to direct action on the streets to highlight the scandals of housing and employment in the City. Supported by like minded activists, Eamonn Melaugh and Finbar Doherty, action committees were formed on housing and unemployment. Squats were supported, landlords challenged, Corporation and Housing meetings interrupted. Eamonn McCann, who had been working for the GLC in London and, at the same time, trying to stop American bombing in Vietnam, came home for a family visit and stayed to lend support. He provided the protest groups with a clear, articulate voice and dynamic, political vision. The Northern Ireland Civil Rights Association was asked by Melaugh and McCann to organise a march in Derry on 5th October 1968. The intemperate and bigoted Bill Craig played ball and banned the March; McCann had ensured that Gerry Fitt and three of his Westminster colleagues from the governing Labour Party plus a selection of UK journalists, including Mary Holland from the Observer, were present to witness the subsequent, totally disproportionate State violence. Derry became a lead story across the World with TV footage of police violence that rivalled the excesses of the Southern US states. Following serious rioting and RUC attacks on the Bogside , a meeting was called by the March organisers to consider future action. What had up to then been viewed as a class struggle, now engaged with a cross community professional and business class. McCann chaired the meeting but refused to be part of a Citizens’ Action Committee (CAC) which he felt would not pursue the ideological vein of the struggle as he saw it. Dermie McClenaghan and other activists decided that it would be better to be in the tent and strive to influence future outcomes. Appointed Press Officer at 25 years old, I found myself speaking to the World Press and trying to reflect a balance on events. Some of the committee had previous involvement with Party Politics but the group adopted an avowedly apolitical and non-violent approach which was adhered to with remarkable selflessness in some cases. Unravelling the semantics of what constituted ‘violence’ occupied a lot of our time; Orange and Green, it was not and the Border was not an issue. The Wilson Government ensured that the Stormont Government agreed to some of our demands. Derry Corporation was abolished and a replacement development commission extended the boundary and built 4000 houses in its first year; the much feared ‘B’ specials, an armed Unionist militia, were abolished; local government election procedures were extensively reformed. As McCann had correctly foreseen, the CAC had no ideological depth and, as a result, no political strategy with which to tackle wider issues. The arrival in 1969 of the British troops on the streets of Derry very rapidly changed the debate to constitutional issues and soon non-violence , in the face of military aggression, was deemed futile by some. I am proud of the role which I played briefly in the City’s history but that lack of a political strategy makes me wonder, if we had encouraged the people on to the streets and then left them there aimlessly. Have I to assume some responsibility for events that occurred thereafter; might Bloody Sunday have been prevented; the daily raids and oppression by the State forces; the physical and psychological trauma of thousands of children; the Balkanisation of the City ; the other atrocities that have left an indelible stain on the City’s reputation – the obscene shackling of an innocent cook, Patsy Gillespie, into a bomb truck; the unspeakable and irrational murder of DuPont Executive, Jeffery Agate, deemed an agent of British economic oppression because his company provided Derry with thousands of skilled jobs.